Nail wraps have become the most buzzed about beauty accessory. And they are far easier than hand drawn nail art – unless you are Van Gogh or Picasso, which I am decidedly not. Hence, it seemed like a good idea to seek the flawless-nail-wrap-commandments from the manicure mavens for fingers and toes that sparkle sans ugly bumps and ragged edges. I would never have thought of this in a zillion years – if your hands are too cold or too warm, the nail wraps may not stay put for the full 10 days (average durability of a nail wrap). Remove all traces of your old nail polish, along with every speck of oil, grease and dust before applying the wraps. If anything (including hand cream) is left on your nails, the wraps will start to peel off. So wipe down your nails with a nail polish remover beforehand. The best thing to do is to give yourself a manicure before applying the nail wraps. However, if you’re in a rush, just make sure to push down your cuticles (with an orange wood stick) so the wraps don’t stick to them instead of the actual nail. Also buff out any ridges but do NOT shine your nails – the nail wraps grip better to a non-smooth surface. Select the best wrap for your size by placing the template over your nail, with the curved end up to the cuticle. Ensure that the sides do not overlap onto the skin – you can trim them if necessary but do not touch the length at this time. Experts suggest using a wrap that is slightly smaller than your nail, so that it lies completely flat with no air bubbles. Who says nail art is just for your hands? Peel the wrap from the protective backing by holding the straight edge at the top (try not to touch the curved end as this will affect the adhesive backing). Apply it to your nail, starting at the base of the nail bed; place the curved end as close as possible to the cuticle without touching it. Then slightly stretch the wrap to the top of your nail to make sure it’s smooth. Try to place it accurately the first time as pulling it on and off will affect how well it stays on your nail. This is always the trickiest step. Gently smooth the excess length over the end of your nail, letting it stick to your finger to keep it taut. Using your thumb smooth the covering over your nail, working from one edge to the other to ensure there are no creases. Finally file off the excess length using downward strokes. You can use a small pair of nail clippers to clean off any white edges that remain after filing. Step 7: Gloss and go! Finish with a clear top coat (unless the nail wrap instructions specifically caution against it) for extra shine. Maybe you should do some research. 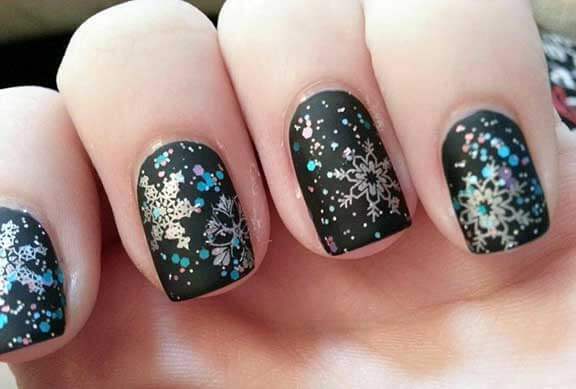 That snowflake mani is NOT nail wraps. It’s a manicure that was done by Cara over at Fox Claws, http://www.thefoxclaws.com. In that case, my mistake. Apologies to Cara. Thank you for credit. I’m not sure how I feel about my image being used on a nail wraps post since the mani is NOT pre-printed nail wraps but polish and Konad stamps instead, I’m flattered that it was done well enough to be misidentified as such though.